This citrus salad is from my Moroccan Sephardic great grandmother, Simmi. She was from Tetuan and then went to live in Venezuela. She taught my grandmother Dolores this recipe, and she taught my aunt tía Marisol who used to make it almost every week because we all loved it so much. The original recipe is made with Seville oranges and I still make it that way whenever I can find them. When they’re not in season, I make it with grapefruit instead. It’s a salad that has been with me since my childhood. It’s easy to make and perfect for summer. Peel the grapefruit, removing all the pith and separating the fruit from the membrane. Cut the segments into bite size pieces. Finely chop the celery stalk and its leaves. 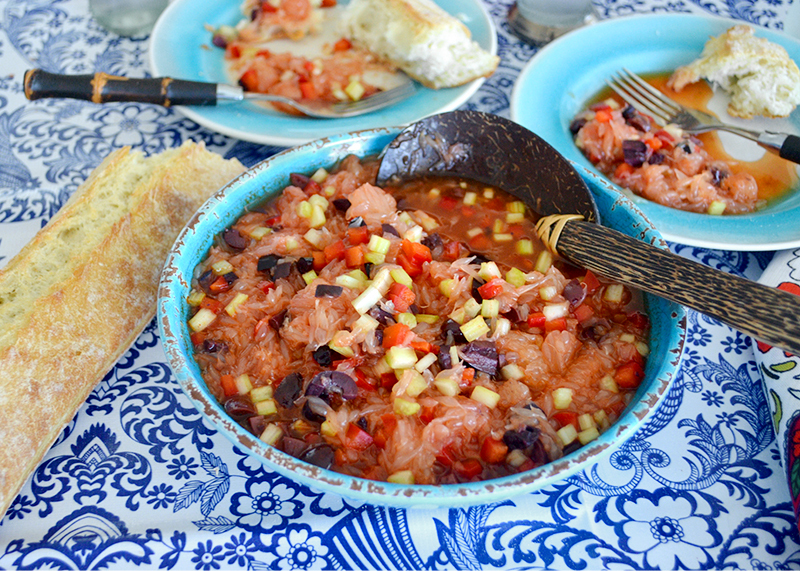 In a bowl, add the grapefruit, celery, red pepper, and black olives. For the dressing, mix the olive oil with the sweet pimentón, the minced garlic, the sugar, and some salt and pepper. Add the dressing to fruit and veggies and stir to combine. The salad is very refreshing because of the citrus juices. It’s a juicy salad that may be served in a little bowl or as an appetizer with any artisanal bread or with a piece of crusty baguette. After I make it, I like to I keep it refrigerated in a jar until I’m ready to use it.